To get into co-counselling, you will need to do a foundation course called CCI Core Training (also previously referred to as the ‘Fundamentals of Co-Counselling’) with a group of other trainee co-counsellors. You will get plenty of opportunity to practice the skills as you learn them, and to experience the release of working on your own issues in a supportive and liberating setting. Along the way the training involves activity, challenge and fun. There is no written work – it’s based on practice, helping you do it. Hopefully the course will feel like a therapeutic experience in its own right. At the end there is a process of accreditation by yourself, your peers and your teacher. The training is intensive and you need to be committed to attending all of it. 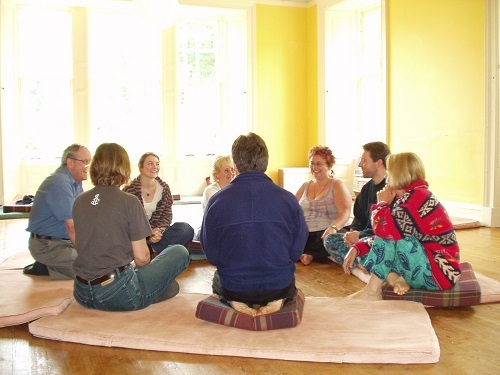 When co-counsellors meet for groups or one-to-one sessions they share the same knowledge of method, techniques and tools, all learned on the course. They may each have their own way of working, but they know what to expect and what not to expect from the other people. This is vital for safety, because we are dealing with our vulnerabilities and want to feel safe with and trusting of our colleagues. …you are a member of CCI and can call yourself a co-counsellor. You then have access to the full international network of residential and non-residential events and groups in CCI, and you may meet up with other co-counsellors whenever you like and have sessions in pairs or small groups. This course gives you all the skills to use co-counselling however you choose. It forms an integrated and therapeutic experience in its own right: even if you decide not to do any co-counselling after the course, the course will give you a space to experience and confront yourself within a therapeutic and supportive group setting. Co-counselling draws from Gestalt, process oriented psychology (POP), psychodynamic, psychodrama and humanistic approaches. The course has traditionally been called ‘The Fundamentals of Co-Counselling’, but this carries the risk of being associated with fundamentalism, which is the opposite of CCI’s way of encouraging individual autonomy in behaviour, beliefs and emotions.